A friend of mine built a SIG556, with as many Swiss parts as 922(r) will allow, custom chambered in 5.45x39mm. 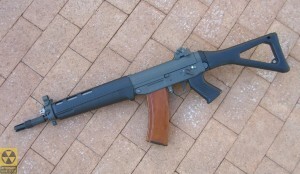 This firearm started as a SG551 demilled parts kit and a SIG556 stripped receiver. Installing the unused East German MPiAK-74N (AK-74) chrome-lined barrel wasn’t a complicated install but the lower mag catch assembly had to be lowered by .300 and the magwell had to be opened for the unmodified AK-74 magazine. However, it wasn’t that simple, the lower required a lot of time to align the parts correctly, much of it necessitating the tedious fit and feel method. This trigger housing (lower receiver) is the original stamped steel design, as opposed to the SIG556R or SIG551A1 aluminum forgings. 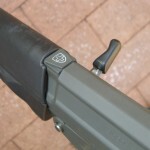 The original select-fire markings on the trigger housing were kept, though inoperable. After removing the Picatinny rail, the mounting holes were filled. 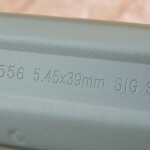 The original SG551 Swiss SIG rear sight was removed from the receiver stub, of the parts kit, and welded where the USA type rail had been removed. The new Swiss Arms SG551 models also have an optional 1913 rail but this rifle maintains that classic look of the original SIG SG551 series of rifles. My opinion is that the use of line is much more aesthetically enjoyable in this configuration. The small details are remarkable: Flip-up front night-sight with full enclosure, upper receiver caliber remarking, refinishing in Cerakote with a re-riveted charging handle wipe (the plastic dust covers rear of the ejection port), black Swiss LE/military furniture, including the pistol grip with rubber trap door, the Swiss v-notch in the front of the receiver for installation of the original quick connect scope mount, and filling in the Swiss crest on the top of the receiver. 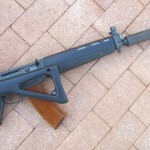 The original Swiss handguard features cooling vents showing off the gas tube. While looking nicer and keeping the overall presentation more European, it does come with its troubles. Molded into the gas block, the Swiss version includes a millimeter thick heating insulator pad, which protects the handguards from melting. 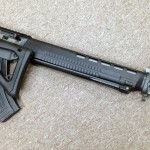 Insulator shims would be nice for retro SG55x builders to eliminate some of the front-to-back looseness in the handguards. The barrel is a 14.5 inch with a permanently attached Smith Enterprise/Ops Inc. suppressor mount, the suppressor is an Ops Inc. 14th Model CQB MBS. There is something about this build that made me start blasphemously wanting a SIG P210 re-chambered in 7.62x25mm. 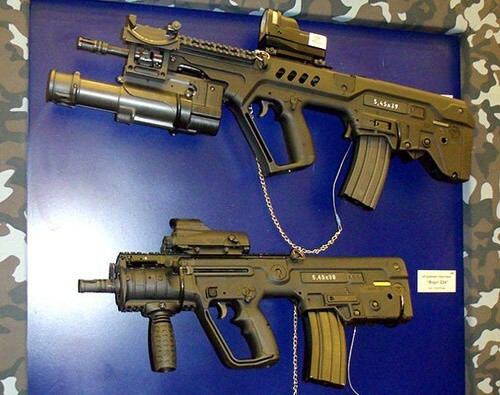 The Tavor SAR 5.45x39mm conversion has been canceled by IWI .. Images of modified Stgw57's have popped up on the internet, ..
Do you know what color Cerakote your friend used on that rifle? I am fixing to do a similar project in another Commie caliber. Also, check out a CZ-52 if you are thinking about 7.62×25. I have an HK P9s and a CZ52, and the internals are remarkably similar. Pretty cool for a crap eastern bloc milsurp. Cerakote calls it “SIG Dark Gray” and it is the finish they do for SIG USA. 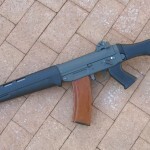 We have a CZ/Vz.52 and have a disassembly video of it up on YouTube (http://youtu.be/mjKlgFxCjN0). Thank you for your comments. Doh! Saw that after I wrote it. Thanks. 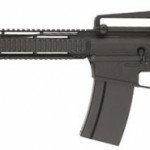 Any details on modifications to the upper and bolt? Specifically the extractor and ejector. I know 5.56 ak bolts can be easily converted to 5.45 by opening the bolt face a bit and swapping the extractor, but I don’t know much about the sig extractors and ejectors so I’m curious to see how that was done. 5.45 sigs are on the top of my list of things I would buy without hesitation if they were available, so I would love more information so I could see if it would be practical for me to attempt this conversion. I would like to know more about this build. Please drop me a line. Any more info or pics on what was done to convert the AK barrel? I am not the one that built this so I talked to my friend about it. 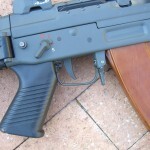 The barrel was mounted like a Belgian FNC, the barrel was threaded and a nut was used. The barrel was sleeved with a fine thread and a cross ping to build up the barrel around the gas block. The bolt is opened up for the larger cartridge and the extractor modified as well as modifying the firing pin to protrude more. Thread specifics aren’t remembered or documented. If you succeed, send us photos. Or, even if you don’t. Good luck.